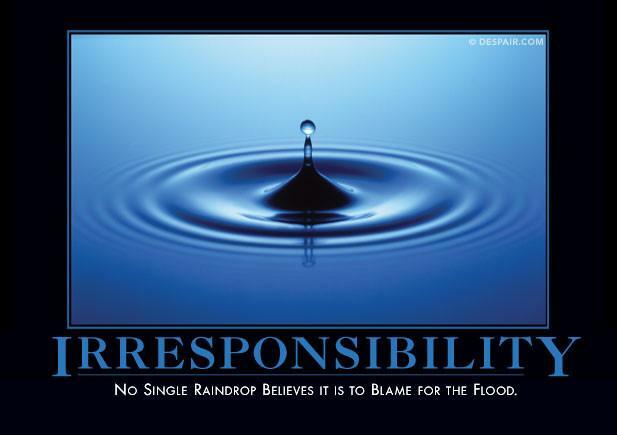 Far too many people are unwilling to take responsibility for their actions – or inaction. How many times have we heard people say, "It’s not my fault," or "It’s not my problem"? Perhaps you’ve even said that yourself. We think we are justified with such thinking until something happens to us and we are on the receiving end of such an empty platitude. No matter how much we like to think we are not to blame — in our heart-of-hearts — we know we are, and that can sometimes be very difficult to "own up" to. A selfish, self-centered heart has no desire to be responsible. Integrity, obedience and trustworthiness are traits that we’d like to instill in our children and see exemplified by our leaders. But unfortunately, many of us fail to practice responsibility in our daily dealings with others. And until we become willing to be honest with ourselves and with others, we will continue to see and contribute to, the decline of our nation and civilization as a whole. Responsible people admit their wrongs. In 1 Chronicles 21:8, David said to God, "I am the one who has sinned. Please forgive me, for I realize now how wrong I was to do this." When David realized his sin, he took full responsibility, admitted he was wrong, and asked God to forgive him. Many people want to add God and the benefits of Christianity to their life without acknowledging their personal sin and guilt. But confession and repentance must come before receiving forgiveness. Like David, we must take full responsibility for our actions and confess them to God before we can expect him to forgive us and continue his work in us. Responsible people are faithful with what they have been given. In the parable of the three servants, Jesus said, "Again, the Kingdom of Heaven can be illustrated by the story of a man going into another country, who called together his servants and loaned them money to invest for him while he was gone." The master divided the money among his servants according to their abilities. No one received more or less than he could handle. If he failed in his assignment, his excuse could not be that he was overwhelmed. Failure could come only from laziness or hatred toward the master. The talents represent any kind of resource we are given. God gives us time, gifts, and other resources according to our abilities, and he expects us to invest them wisely until he returns. We are responsible to use well what God has given us. The issue is not how much we have, but how well we apply what we have been given. God rewards faithfulness. Those who bear no fruit for God’s kingdom cannot expect to be treated the same as those who are faithful. And as long as we are here on earth, we have a responsibility – to God, to ourselves, and to each other – to care for one another, to protect one another and to love one another. Unfortunately, such is not the case. In fact, Jesus even warned us that near the end of the world as we know it, sin will be rampant everywhere, and the love of many will grow cold (Matthew 24:12, NLT). But along with the warning he also gave a promise "But those who endure to the end will be saved" (Matthew 24:13). I know that there are many people who do not want to believe that one day God will hold them accountable for what they did with what He gave them. I know there are many people who hate God and hate those who love Him and praise His holy name. I know there are people who hate and kill other people "in the name of" God, thinking that "they are doing God a service" (See John 16:2). The "Bottom line" is this... Like it or not, you and I ARE responsible. and for every deed we have done (or have failed to do). Those who know how dark their heart is are the ones who do not want to be held accountable for what they’ve done (or failed to do). That is why they hate God and do not want to hear the truth. It is not really God that they hate. Rather, they hate themselves. For in their heart-of-hearts they have always known the truth and have chosen to ignore it. A heart full of the light and love of God has nothing to fear.